I admit it, I'm a food truck stalker. Their food is delicious, exciting and fresh. I've managed to hunt down five of the 10 trucks on the streets of Sydney. I've not seen inside one (except for on Top Chef, does that count?) but I suspect there must be some serious kitchen design genius going on inside to be able to whip out those tasty morsels with such limited space. Let me show you the outside of three of these trucks. First up there's Eat Art Truck, run by Stuart McGill (former Tetsuya’s sous chef) and Brenton Balicki (former Quay chef). The truck is a canvas with regularly changing exterior courtesy of talented street artists. And those pulled pork buns are OMG-amazing and I've eaten a lot of BBQ in Texas. See more photos on the Eat Art Truck Facebook page. Eat Art Truck during VIVID 2012, artwork by Phibs. The second truck is the Veggie Patch Van, which aims to source fresh, local produce for a seasonal menu. A collaboration between design firm TMOD and restaurant Yulli's, it's not surprising that there's more to this truck than meets the eye. On the outside, the truck is covered with re-used wood, there are solar panels covering the entire roof for power and apparently vegetable oil runs the engine! Spreading the 'paddock to plate' sustainability message, the food truck is super stylish and draws its inspiration from a farm house surrounded by a veggie patch. Check out those herb boxes! 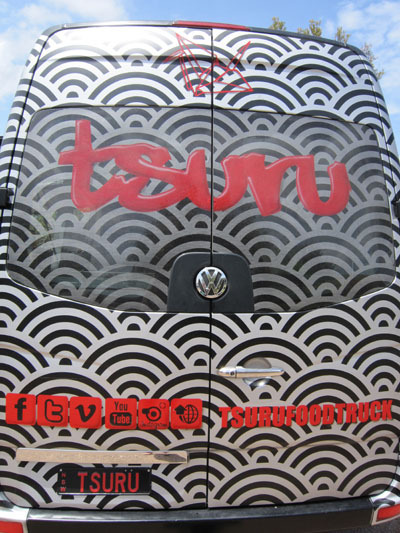 Lastly, Tsuru food truck reflects its Asian flavour with a graphic fishscale pattern contrasted with red branding. Tsuru is crane in Japanese and a nice touch is the addition of a paper crane with each meal. The crispy chicken wings are a definite winner! These 10 food trucks are part of City of Sydney's year-long trial. Make sure you get out and support them so they stick around! Follow their whereabouts on Twitter, Facebook or using the iPhone or Google Play app. November 19, 2012 by Makisa Hoang. Sergio Mannino's Non-Flying Carpet is a handmade, modular wool rug created in Nepal by professional artisans. Launched at Wanted Design 2012, this rug can be laid in different configurations and is designed to recreate the look and feel of a courtyard. As fun and quirky as it is, it would be easy to relegate this to a kids room, but why should they have all the fun? With a few accessories, this rug would make quite the statement in a sun room or informal lounge. Think about outdoor furniture that can be used indoors, organic shapes and a good serve of real greenery (as opposed to the wool kind). Clockwise: Cote Sud Chair (68 x 55 x 98cm), $545 polished, Le Forge. Dachshund Lamp (20.5" x 6" x 13.5"), USD$79, Urban Outfitters. Non-Flying Carpet (six pieces, width 12' max, depth 9' max), USD$7,800, Sergio Mannino Studio. Cushions Livingstones Smarin (various sizes), Vincci Style. Serax Collections Pantone Universe flower pots (XXL 38 x 38 x 30cm), $197.95, Beautiful Spaces - Inside and Out. Non-Flying Rug first spotted in Furnishing International. November 12, 2012 by Makisa Hoang.